QuizFortune Trivia - The Ultimate Trivia App! » QuizFortune Trivia - The Ultimate Trivia App! Published: 2014-03-13, by Manu Galvez. You're a smart guy, right? Well, let's show it off. QuizFortune Trivia gives you the chance to prove it. With a database of 100,000 questions, you will have enough sample to know how much you know about different topics. 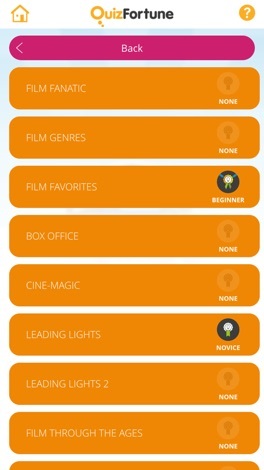 In fact, QuizFortune lets you choose among a well-curated list of categories: music, movies, TV, culture & politics... The most common topics are there with dozens of sub-categories. Unlike trivia board games, there's no need to worry anymore about if questions are up-to-date. In QuizFortune you can choose past events or current facts, even daily trending stuff. It's always in the loop. Of course, one of the strongest points of QuizFortune is that you can play either single player or challenge your Facebook friends to beat you in quiz duels. Even if you prefer to play alone, you won't feel like in such a way: QuizFortune features online leaderboards in which your personal bests can be submitted and compared to players' scores from all around the world. QuizFortune is set in a simple yet neat and user-friendly interface. However, I'm missing a couple of things. First, a open online duel system: not only restricted to Facebook friends. Second, a smoother performance. It takes longer than desired when navigating through menus. Regardless, QuizFortune Trivia is a full-featured and challenging quiz game. 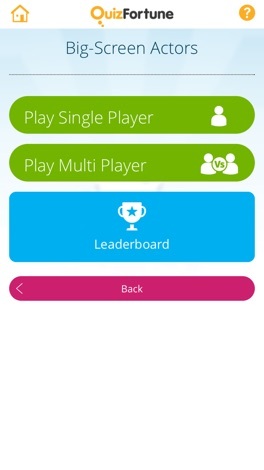 THE ULTIMATE SINGLE PLAYER & MULTIPLAYER TRIVIA APP IN THE WORLD! SHOW OFF your TRIVIA KNOWLEDGE with QUIZFORTUNE! 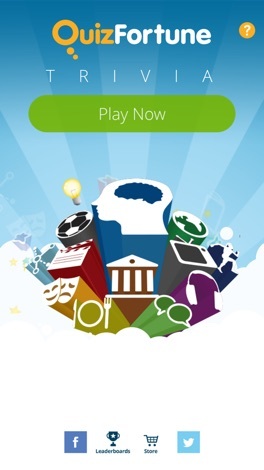 Play real-time trivia games, compete against players from all around the world & share with your friends on social media. Questions are taken from our database of over 100,000 questions with over 800 topics & constantly updating. Our intelligent app offers you quality, hand-picked content on ALL your favorite topics. Whether you want to test your own knowledge or challenge friends, QuizFortune Trivia provides the ultimate quizzing experience – And it’s FREE!!! Each of QuizFortune’s eleven categories (Film, Music, TV, General Knowledge, Sport, History, Geography, Science & Nature, Culture & Politics, Arts & Literature & Food & Drink) contains a series of Trivia Packs with ten quizzes inside. Work your way up to thirty light bulbs within each pack to be given the title of QuizMaster and earn 50/50 bonus hints as you go! So what are you waiting for? Download QuizFortune now and begin your journey to becoming a QuizMaster! ◉ Select from specialist subjects - from Football to Blockbuster Movies, we’ve got your interests covered! ◉ Use 50/50 hints when you can’t afford to lose… and then earn more when you win! ◉ A comprehensive overview of your stats and achievements, showing you how you’re doing in individual categories & topics. Follow us on Social Media. You’ll find tips and tricks and other helpful information! ◉ ◉ ◉ Love our app? Please leave us a review! Download QuizFortune Trivia - The Ultimate Trivia App!